With a history spanning more than 175 years, Rush has been part of the Chicago landscape longer than any other health care institution. It began with Rush Medical College, the first medical school in the city and one of the earliest in the Midwest. Powered by passionate faculty, students, researchers, residents and fellows, today the University continues the traditions of outstanding health care education, research and community service that have been with us from the very beginning. Learn more about Rush University and its predecessor schools in this presentation from Rush archivist Nathalie Wheaton. Even when Chicago was just a village of 4,000 people, Rush’s founders recognized the need for quality medical care. In 1837, the Illinois state legislature chartered Rush Medical College, just two days before the city of Chicago was incorporated. The school was founded by Daniel Brainard, MD, a distinguished surgeon and scientific investigator, and was named for Benjamin Rush, MD, a physician and signer of the Declaration of Independence. Many great names in the history of American medicine — William Heath Byford, Christian Fenger, Nicholas Senn, Ludvig Hektoen, Frank Billings, James Bryan Herrick and Arthur Dean Bevan, to name a few — have served as faculty here, contributing to the understanding of diseases and the development of treatments, as well as raising medical education standards. In addition, Rush Medical College awarded David Jones Peck, MD, a doctor of medicine degree in 1847, making him the first African-American man to receive this distinction from an American medical school. Rush faculty established a teaching hospital, Presbyterian Hospital, in 1883. The Presbyterian Hospital School of Nursing, a forerunner of today’s College of Nursing, was founded in 1903. In 1956, Presbyterian Hospital merged with nearby St. Luke’s Hospital, which was founded in 1864. Their nursing schools also united to create the Presbyterian-St. Luke’s Hospital School of Nursing. In 1969, Rush Medical College merged with Presbyterian-St. Luke’s Hospital to create Rush-Presbyterian-St. Luke’s Medical Center. Rush University was established in 1972. The College of Nursing and Allied Health Sciences joined Rush Medical College the following year. James A. Campbell, MD, served as the University’s first president. Under his guidance, the institution expanded from two to four colleges, adding the College of Health Sciences in 1975 and the Graduate College in 1981. Campbell chose Luther Christman, PhD, RN, FAAN, to serve as the founding dean of the College of Nursing. The first male dean of an American nursing college, Christman introduced nursing reform and new education standards at every opportunity. From 1984 to 2002, Leo M. Henikoff, MD, served as University president. This was a period of expansion of research at Rush, including construction of the Cohn Research Building. The first two decades of the 21st century have been a period of tremendous growth for both the University and the Medical Center. Rush-Presbyterian-St. Luke’s Medical Center was renamed Rush University Medical Center in September 2003 to reflect the importance of education and research to the Medical Center’s patient care mission. In 2012, Rush opened the distinctive butterfly-shaped Tower building, which has already become a Chicago icon. Many of our students, residents and fellows now train in this leading-edge facility. In early 2019, Sherine E. Gabriel, MD, was named the fourth president of Rush University. Gabriel succeeds Larry J. Goodman, MD, who was University president from 2002 to 2019 (and remains Rush System CEO). 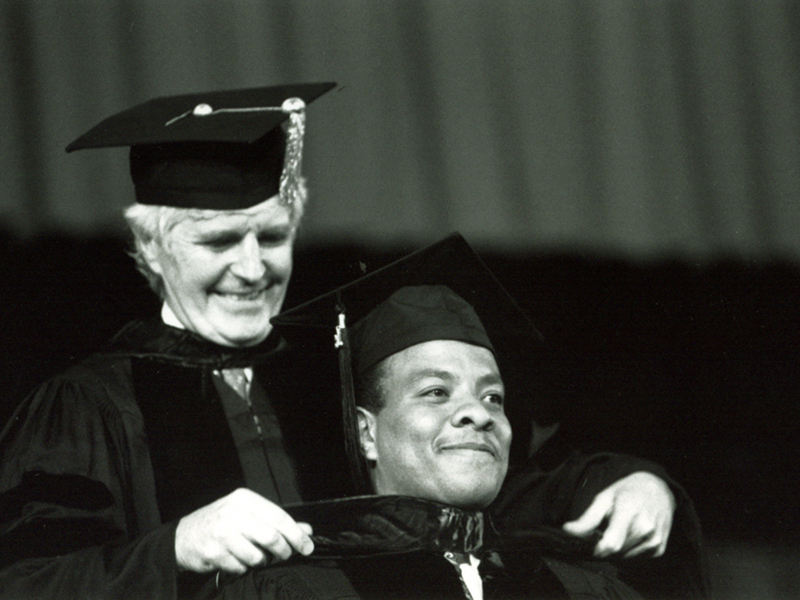 During Goodman’s leadership, enrollment in the University doubled to more than 2,500 students. In the years ahead, Rush University looks to expand further, on campus and online, and continue to play a role in transforming health care through innovative research and education.